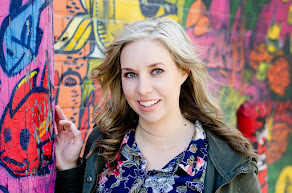 Welcome to the back-to-school edition of the Blended Blog Asks! 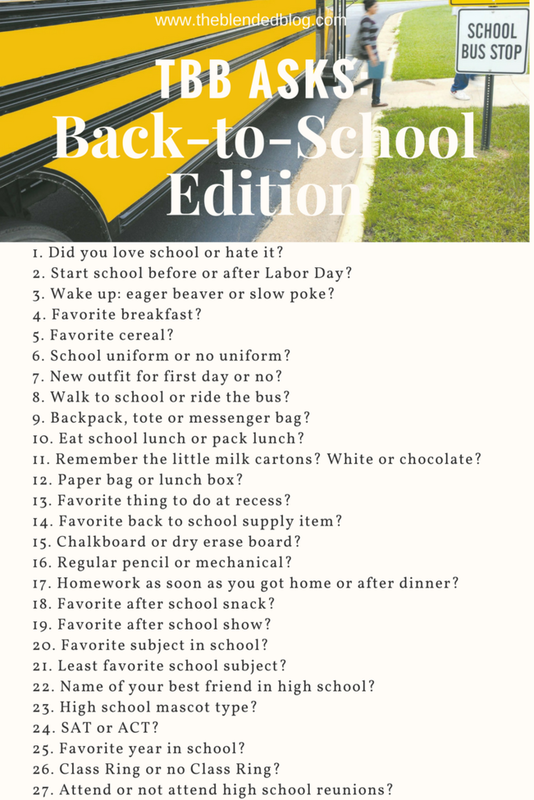 This month the ladies at the Blended Blog have come up with some school related questions to make for another easy and fun post for us and you! Check out the questions and my answers below and feel free to grab the graphic, create a post and linkup with us below! Did you love school or hate it? For the most part I really liked school, I'm kind of a geek like that. Start school before or after Labor Day? Wake up: eager beaver or slow poke? Pancakes or french toast with real maple syrup but that usually wasn't a week-day breaky given how long it takes to make/eat. As a kid Lucky Charms but I was rarely allowed to eat it... apparently a bowl full or marshmallows is not an ideal way to start the day? Mostly no but I went to a Catholic High school for one semester and did wear a uniform there. New outfit for the first day? ALWAYS and it had to be something I never wore prior to that day. Walk to school or ride the bus? Backpack, tote or messenger bag? Eat school lunch or pack a lunch? Packed a lunch for the most part. My elementary school didn't even have a cafeteria that served food and I didn't buy lunch that often in high school. Remember the little milk cartons? White or chocolate? Cartons? Um those are still a thing. Does anyone remember the BAGS of milk? Please tell me I'm not the only one. Also, chocolate was always preferred because, well, chocolate. Paper bag or lunch box? Paper or grocery bag... I don't remember having a lunch box. Weird. Favorite thing to do at recess? I remember lots of girl drama in elementary school... then boy drama. Lots of drama lol. Favorite back to school supply item? I loved picking out new binder colors and pens. Yup, geek. Chalkboard or Dry Erase board? Chalkboard. Dry erase wasn't big until later I think. Mechanical because they just seem fancy. Homework as soon as you got home or after dinner? Um how about the very last minute right before bed? I was a procrastinator to the nth degree (this carried through university and all 3 of my degrees... whoops). Math. Me and numbers do not get along. Name your best friend in high school? I had a few (because I went to 3 high schools) but Nancy was and still is my bestest. I had 3 - falcon, phoenix and panther. I'll take none of the above. Canada eh. I honestly have no clue... too much pressure to pick and nothing stands out like "that was the best year EVER". Attend high school reunion or not? Make sure you link up your Q&A posts below and stay tuned for next month's TBB Asks - fall edition (October 2nd).